Tom Dornhofer is the current relief Chief Engineer aboard the R/V Endeavor. He has been with the ship off and on since the end of last August. His first experience was working on this vessel when they brought her back to Rhode Island from Africa, he thought he was simply answering an ad for a large ship delivery job. He is in charge of all technical aspects and machinery on board, from things working smoothly during deployments to ensuring we have air conditioning, Tom is the man to see. He was born in Long Island, NY and has been on and around the water his whole life. When he was very little, he would go to work with his dad aboard a 12’ boat and go fishing. He later went to SUNY Maritime College in New York, where he graduated with a B.S. in Marine Engineering as well as his 3rd Assistant Engineers license. After graduating, Tom was off on his life’s adventure. He worked on large ships for several years, and later worked in New York harbor on tug boats. Once he earned his Chief Engineer’s license, he spent time in that position on everything from tankers to ferry boats. Tom also worked on special effects for some big screen movies, opened his own business for awhile, worked in a shellfish hatchery, and was a harbor master at a marina in East Hampton. 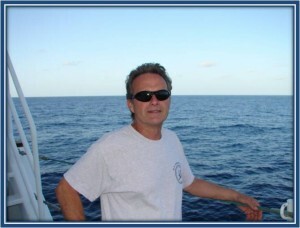 He decided he wanted a change of pace, and went down to South Florida to get his STCW (Standards of Training, Certification & Watchkeeping for Seafarers )license. One conversation he had while in the course led to a job aboard a 150’ yacht that was to be delivered to the Caribbean. Since around 2000 until this past year, Tom has been around the world working on various mega-yachts for trips and deliveries. He said you couldn’t beat spending winters in the Caribbean and Southern countries, and summers in the Mediterranean when you come from New York. Tom says his favorite place to visit is one he has not been to yet. Though he has seen a great many things this world has to offer, he’s not done enjoying his time on the ocean. He says the best way to learn something is by doing it; many of his experience comes from on the job learning, not books or a test. Going to sea has been good to him, but he says it’s not for everyone. Like most of the crew, Tom said balancing this line of work and family is very tough. He is a father to a son who is currently working at a TV station up north, near where he lives in Jamestown, NY. When Tom is not out on the ocean, he is home enjoying his family and working on his 35’ sailboat.